August 29, 2005 - We all watched in horror as Hurricane Katrina pummeled New Orleans and surrounding areas. The news ran endless video of people stranded on rooftops, corpses floating in filthy floodwater, homes flattened, and despair etched on every face. Many of us watched the devastation from afar, hearts aching for the desperate residents of Louisiana. Katrina's survivors have told their stories in every possible medium. I'm sure I'm not the only one who has been moved to tears upon hearing their words. Those who are able have spoken, assuring that their heartbreak and courage will never be forgotten. But what of those who can't speak? Who will tell their stories? 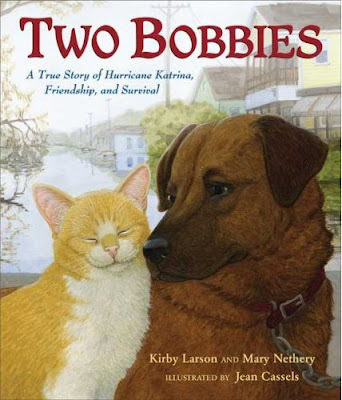 When authors Kirby Larson and Mary Nethery heard about Bobbi and Bob Cat, two Katrina survivors, they knew they could act as mouthpieces for the courageous duo. Two Bobbies is the heartwarming result of their collaboration. The picture book recounts the true story of a "wisp of a cat and one puppy" who were left behind to face the storm's wrath on their own. Tethered by a length of chain, Bobbi (the dog) was unable to leave his porch. Bob Cat stayed by his side. When Bobbi finally broke free, the pair wandered the soaked streets of New Orleans looking for food and shelter. Gangs of rabid dogs roamed the streets as well, claiming all scraps for themselves. Bobbi and Bob Cat grew thin from hunger. Finally, four long months later, the pair were rescued by the Best Friends Animal Society. When the shelter's volunteers placed the animals in separate rooms, Bobbi howled in protest, barking and pacing until Bob Cat was once again by his side. Their devotion to one another touched everyone's hearts, and efforts were made to find someone who could care for both Bobbi and Bob Cat. Leaving their damaged city behind, the duo found a home in Oregon, where they could finally be at peace - together, as always. Two Bobbies tells a sweet, simple story about friendship and survival. It discusses Katrina in a way that is more hopeful than scary, informing kids about disaster while focusing on the courage and love shown by the animals. The characters, illustrated in soft, gentle colors, will grab the reader's attention and steal their hearts clean away. It's impossible not to root for this brave pair and the friendship that saved them both from the ravages of a deadly storm. I'm the first to admit that I'm no picture book expert. I have my favorites, of course, and they are those that offer unique plots, engaging language, and stories that make me laugh, cry or shout with joy. While I enjoyed Two Bobbies, I didn't quite get the A+ feeling I glean from the masters (Kevin Henkes, Patricia Polacco, Dr. Seuss, etc. ), but I still think it's a touching book that beautifully celebrates that most valuable of human and animal treasures - a friend. Sounds like a very touching book. What a sweet book. I hope it'll educate children and adults -- those who have time to prepare, unlike so many of the Katrina folks -- about proper pet care when a storm is coming.